I was going to keep up with the one-a-day quilt-along that was going around this summer, but I got distracted. Sometimes I’m just not that good at keeping up with the crowd! 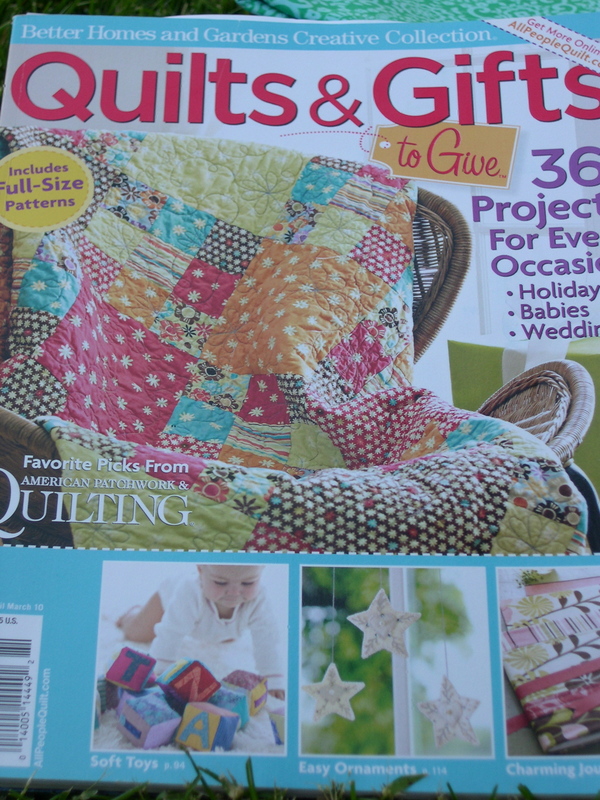 I liked the quilt on the cover of this magazine and decided that would be a great project for the Darla fabrics I had in my stash. Here’s what the finished top looks like, which measures 50 inches all the way around. I think it turned out cute and sweet with two sugar cubes on top! I pieced the back together like this. Now I just need to another Sunday to sew on the binding fabric. It will be nice to check this UFO will be off the list. Then I will only have about three more UFOs to complete. Two sugar cubes is right! 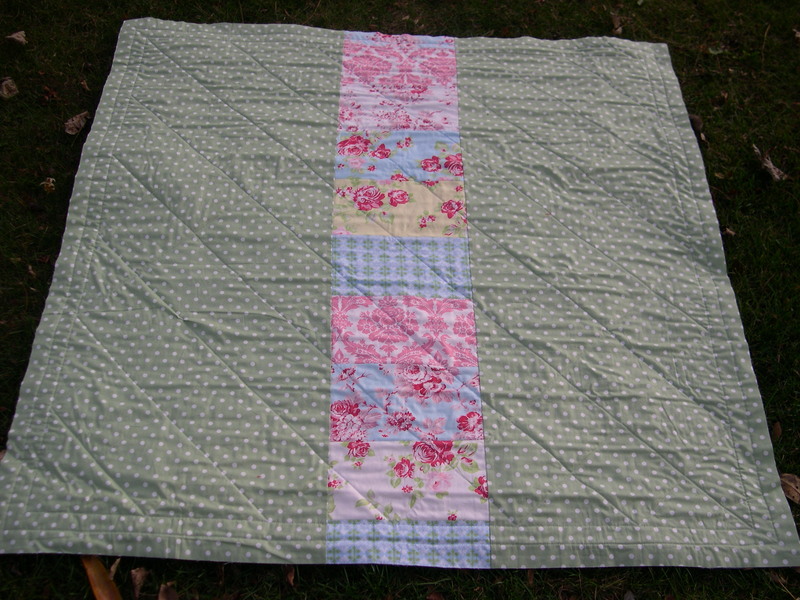 I like the diagonal quilting and will have to try that. I really like the pieced back, too. Good luck with your UFOs! 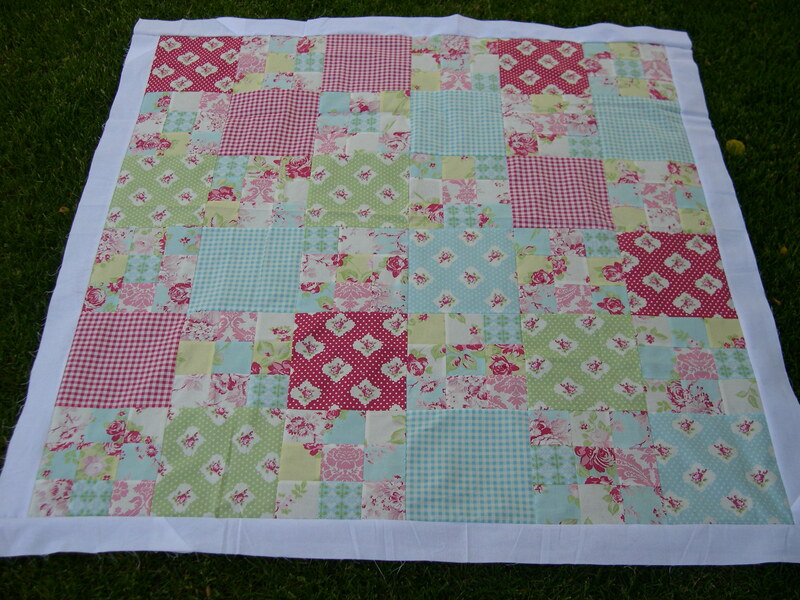 I love the Darla range and it looks so pretty in your quilt! Definitely sweet with two sugar cubes on top!! Oh so soft and sweet with two sugar cubes on top! I love it! And the back is great, too! 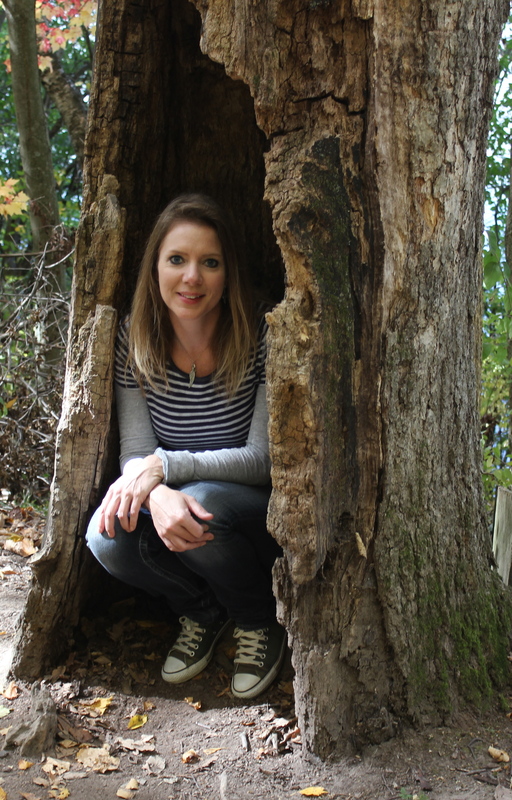 I didn’t keep up either…but I will finish one day! Love your quilt…and love those fabrics! Very pretty!!! Love the fabric choices! Wouldn’t it be a blast to decorate a large bedroom all in Darla? And budget be darned!! I know it’s been done, but . . .I’m just sayin’ ! That sweet quilt would look perfect draped across the foot of the bed! I, too, love this pattern! 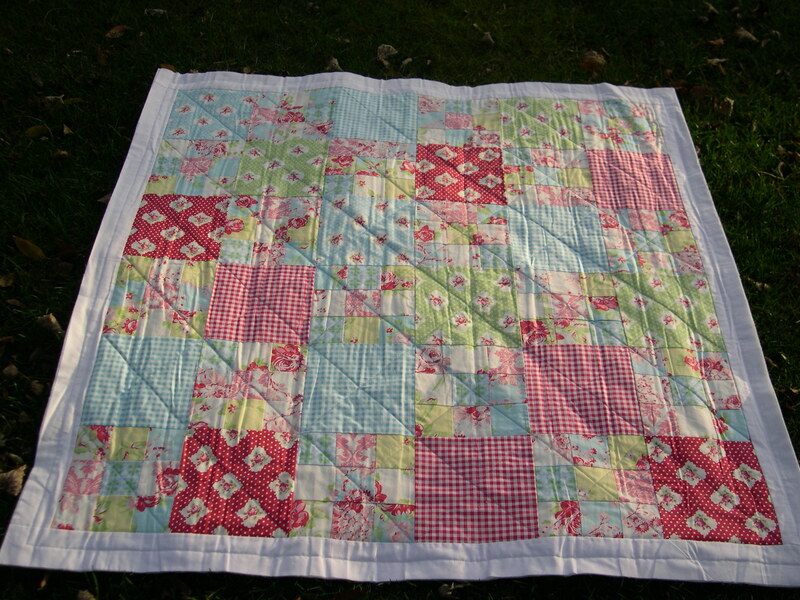 I love how your quilt turned out! I am also one of those that get distracted easily! 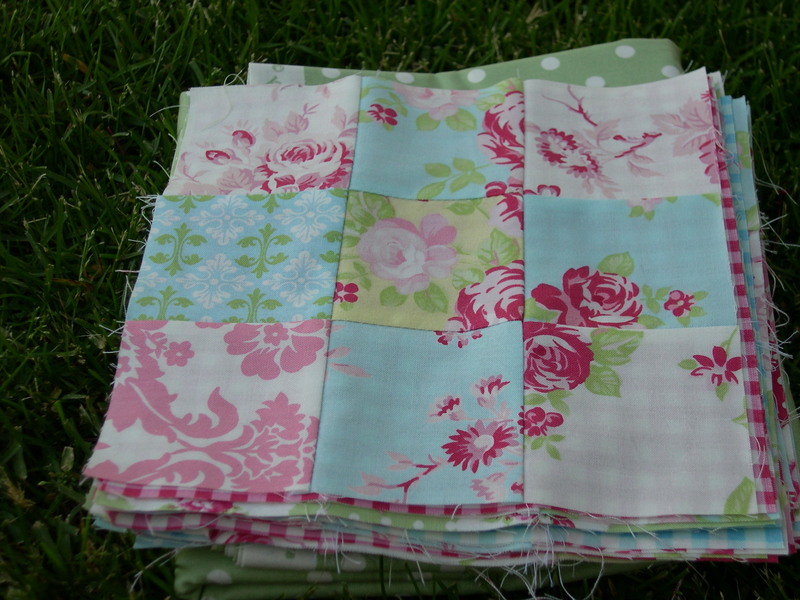 And i adore Darla range of fabrics and your quilt is sooo amazingly beautiful! Love it lots! Have a lovely merry happy day and love to you! It looks great Terri! A wonderful job! And I love the colors that you chose. So hard to get all those projects done! You are too much..this quilt is heaven!! only three other ufo’s? wow your good! add a zero adn maybe you’ll be caught up to me! looks good lady! Love it!! A late finish is better than never, I say. Very pretty~I think Darla is one of my all time favorite fabrics! Have a good weekend, Terri!